Early in my photography path, I didn’t pay much attention to the different kind of camera bags that were available. I knew I wanted a bag that could carry everything at the time, and I was looking for a backpack style camera bag. As time passed, my lenses collection grew which I didn't need to carry (or even use) it all. I also didn't want to carry the backpack camera bag with me all the time since it was bulky and heavy. I wanted a second, more mobile-friendly camera bag that could carry my essentials for me and my lightweight "on-the-go" setup if you well. A new camera bag was on its way, this time it was a messenger style bag which is more in line with what I was looking for. As soon as the package arrived, I ran straight to my office to open my new camera bag with excitement on my face that is found on most kids seeing the stack of gifts (by the way, this package arrived before the holidays). Let me tell you, there's something to say about first impressions, Blackforest went beyond my expectations from the start as soon as I opened the package. With the opening of the first flap of the cardboard box, I was greeted and overwhelmed with the smell of brand new leather. This triggered flashbacks of when I was younger being around my father’s new leather briefcase, this was off to a great start as I read the thank you card and removed the Vinson All Leather Camera Messenger Bag from the canvas Blackforest Handcrafted sack. Who knew I would be getting two bags which I now to store miscellaneous items in my office. If you are looking for great styled bag paired with function and protection with amazing quality leather, this is it. The Vinson Messenger bag is crafted out of premium quality, genuine leather filled with red premium cotton twill lining for padded protection on the inside. I couldn't be happier with the styling and quality of the bag. Also inside are three removable padded compartments dividers plus one large divider to create space for a 13.3-inch laptop. All four dividers came be easily removed and reconfigured to your needs, or use this as a luxury travel or workout bag. The backside of the messenger bag comes with a large easily accessible pocket featuring a magnetic branded badge great for carrying slim items that you may need quick access to (for travel, your airline tickets and other docs fit perfectly here), or you can store your tablet device there which I sometimes carried an iPad there. Each side of the bag features a pocket for quick access below the hooks to where you can attach the padded adjustable shoulder strap. Under the front flap features two more pockets for easy access with a larger zipped pocket for securing items that you don't need easy access to. There are actually three mini pockets stitched perfectly for your memory cards in their protective plastic case with one slightly larger pocket which my Seagate Backup Plus Slim portable hard drive fit perfectly into. Depending on the type of shoot I was headed off to determined which bag I would grab. 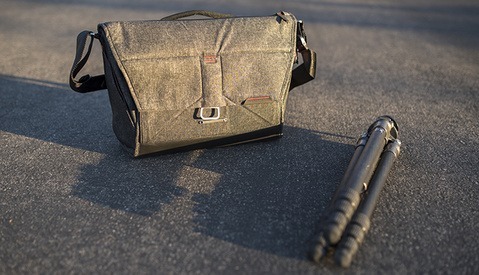 When I only need a couple of my lenses and a few accessories along with the camera, I grabbed the Vinson Messenger Bag. Honestly, this is the bag I am using the majority of the time now. The product description has it listed to store two or three lenses, I was able to pack the messenger bag with my Canon 6D and four lenses; two stacked together in each compartment when I needed more lenses depending on the shoot. This included my Canon 85mm f/1.8, Canon 35mm f/2, Canon 50mm f/1.4, and my Canon 24-105 f/4. With the 50mm and 35mm being the short lenses, there was enough room to put these on top of the others with body caps touching (next time I will pack cleaning clothes to put between them). There was still room to store my 2013 13-inch MacBook Pro in the laptop compartment making it a very snug fit. If you have a newer and slimmer 13-inch laptop, you will have no problem carrying it around with your camera. I didn't always carry four lenses in the bag as I mostly carried three with the camera, I just wanted to see how much I could carry if I needed them. If you have longer lenses, then two will fit perfectly with your camera. I recently took a trip to which I used the Vinson Messenger bag to carry some clothes and my MacBook along with my camera backpack which stored all my gear during the traveling part. Once I arrived at the hotel, I put the compartments back in and used the messenger bag for most of the trip with the lenses I needed for the day. Walking around with a camera in hand and the Vinson messenger bag across my body was much easier than using my much larger backpack. When I needed to swap lenses, I just swung the bag to my hip, opened the flap, and switched lenses which was obviously was easier to do than setting down the camera backpack each time when I want to swap lenses. Quality. The attention to detail and the quality is just superb. Presentation. From the moment I opened the package, I was impressed. Depending on what you are going to put into the side pockets, they are rather tight and I wouldn’t mind a bit more breathing room. If I had to find something else to improve, I would also like a bit more padding on the shoulder strap but honestly, that’s getting really nit-picky as I didn’t have any real issues with it. Possibly different latches to keep the flap closed. 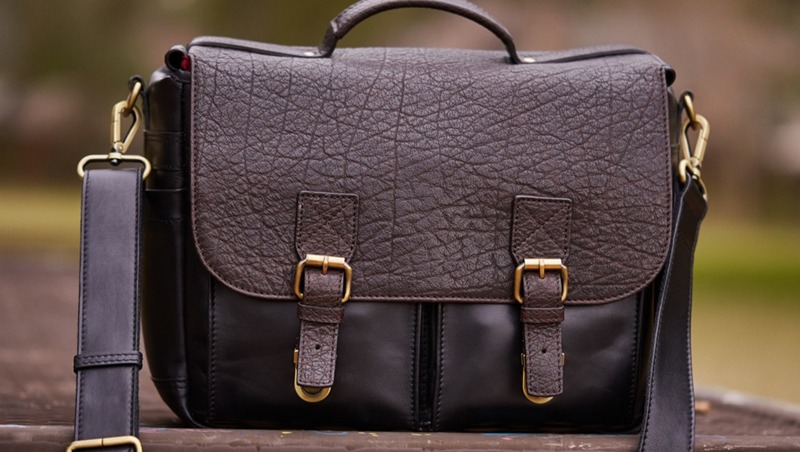 From the moment I opened the package, I was blown away by the presentation, quality, and functionality of this fancy, full grain leather messenger bag. Honestly, I found myself going more minimalistic to my shoots and using the Vinson Messenger Bag more often rather than carrying the backpack style camera bag with more gear. 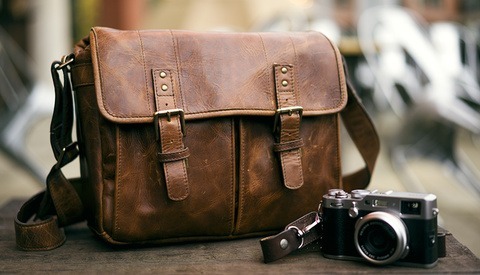 I just loved everything about this bag, it's a well-made, quality messenger bag. It's perfect for a minimalist, on-the-go camera setup. 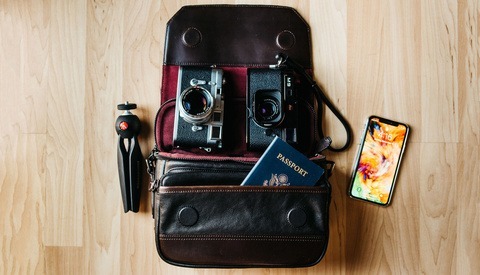 If the dark brown and black leather combination doesn't fit your style, Blackforest offers a few different variations of messenger style camera bags currently with free shipping worldwide. You can see more selection on their website. In this day and age of plant based and synthetic bags that are extremely durable and are very efficient, it is unacceptable to have an dead animal product offered to photographers who document wildlife, environmental subjects and world life in general. Please consider not purchasing this and all animal based products that perpetuate the killing of millions of animals for no reason! I hope B&H and other suppliers do not carry it. I can't wait to carry a bit of leather like this on my shoulders, created from harvesting animals who would not exist on this earth without human breeding programs and intervention. Thank you, Blackforest, for providing sustainable products whose manufacturing has no reliance on fossil fuels or result in land clearing and deforestation, and I sincerely hope it's carried far and wide by retailers across the globe. Good that you're not an animal in the wild, eh? Matters not. This product and most others of leather don't come from animals in the wild.